Fluorosilicic Acid Market size was around USD 670 million in 2018 and the industry expects consumption at over 680 kilo tons by 2025. Increasing market demand for water fluoridation, electroplating and oil well acidizing may foster fluorosilicic acid market size. It is used by municipal corporation in water treatment process to maintain fluoride level. Hexafluorosilicic acid is widely used in metal surface treatment processes as it induces non-chromium surface passivation which may promote product demand. Global water treatment market size was valued at over USD 25 billion in 2018. Increasing demand for fluoridation in drinking water is likely to be the major driver as fluorinated water reduces severity of cavity and allow the individuals to experience less pain occurring from cavities. Increasing product demand from textile industries for the removal of stain and rust from fabrics is likely to foster the hydrofluorosilicic industry growth. Global textile market was valued at over USD 925 billion in 2018 and may exceed by USD 1.2 trillion by 2025. The product is used for pH adjustment in industrial textile processing or laundries, thereby driving the product growth. Hydrofluorosilicic acid is widely used in oral care products such as toothpaste, mouth wash, floss and teeth whitening. Global oral care products market demand was valued at over USD 28.5 billion in 2018. Increasing consumer awareness for oral disorders such as gingivitis, denture irritation and bleeding gums is likely to boost industry growth. It strengthens weak spots and exposed roots and aid in preventing early stages of tooth decay, which may foster the product demand. Fluorosilicic acid market size for 40% grade may witness gains at over 5% by 2025. The product is used as a chemical intermediate for aluminum trifluoride, cryolite and other fluorosilicates. It also act as a neutralizer for alkalis, which may boost industry growth. 35% grade segment was valued at over USD 270 million in 2018. It is used as wood preservation agents and as herbicidal agent, which is likely to drive the industry growth. 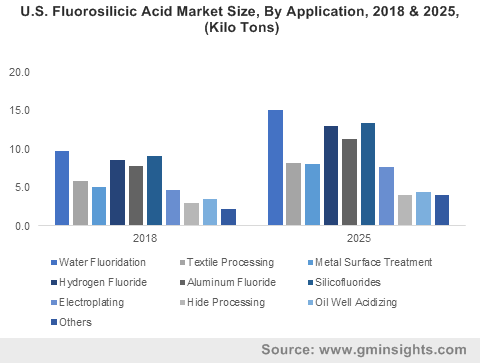 Fluorosilicic acid market demand from water fluoridation was valued at over USD 120 million in 2018. It is used in public water treatment plants for lessening in dental caries by regulating the fluoride content of public water supplies. It is added to water treatment plants to give a total fluoride F level of which has been recognized as active component for reducing tooth decay, thereby fueling product demand. Textile processing application may register significant growth at over 5% up to 2025. It is used in removing rust and stains from the fabrics and tend to decrease the surface tension of the substrate by forming a thin film coating around the fiber. Moreover, it acts as a laundry chemical when added to cloths during the rinse cycle to lessen water pH and assist the removal of cleansers and corrosion stains, thereby stimulating the market demand. Hexafluorosilicic acid market demand from metal surface treatment may surpass USD 100 million by the end of foreseeable timeframe. The product acts as a non-hexavalent chromium formula component with low chlorine content and act as a stable product during surface treatment process which is likely to fuel the product demand. North America, driven by Canada and the U.S. market size may register significant gains at over 5.5% up to 2025. Increasing consumer consciousness towards the importance of clean water may propel the regional industry growth. Government regulations are forcing municipal corporation to use the product in public drinking water to avert tooth decay problems, which in turn may accelerate industry growth. 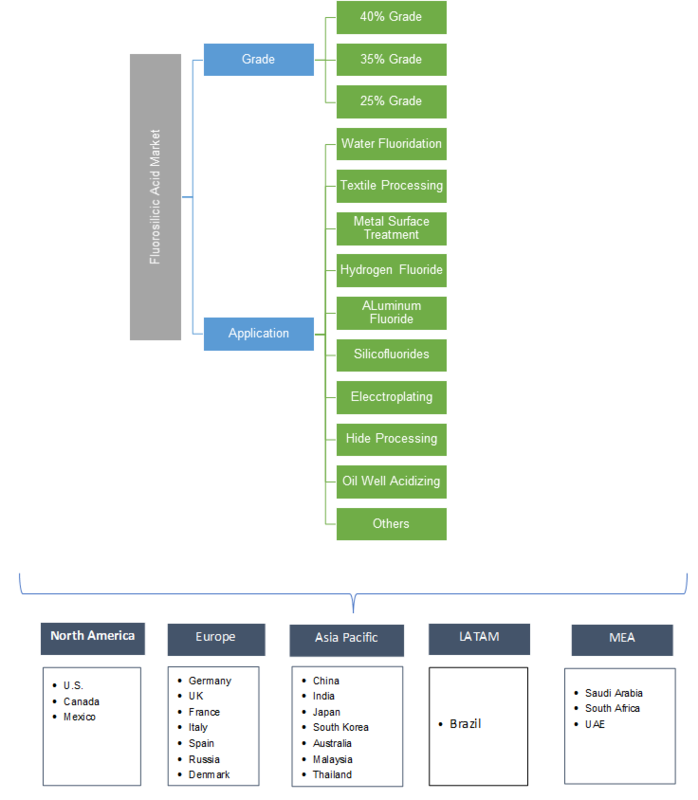 Europe led by UK, France, Italy, and Germany fluorosilicic acid market demand was valued at over USD 190 million in 2018. Growing prevalence of periodontal disorders coupled with edentulism in the region which lead to tooth loss, severely affecting quality of life, may boost the product demand. These are used in toothpaste, mouth wash and other dental products to maintain fluoride level which averts tooth decay, thereby driving the product demand. Asia Pacific fluorosilicic acid industry led by China, India and Japan is likely to register significant gains at over 5.5% by the projected timeframe. Changing consumption pattern, increasing population and growing demand for clothing may drive the textile industry in the region. Fluorosilicic fabric treatments offers stain and oil resistance and durability in the textile industry which will accelerate product demand. Global fluorosilicic acid market share is consolidated with companies such as Solvay, Mosaic, Gelest, Sigma Aldrich and KC Industries. The manufacturers are engaged in new product development to boost their production and expand their presence globally. Furthermore, the industrial operators are concentrating to offer cost-effective products to foster overall industry growth. Fluorosilicic acid is a clear, colorless liquid that possess slightly sharp odor and is manufactured and sold as water solutions. Increasing demand from chemicals, textile and water treatment industry may drive the overall industry growth. Hydrofluorosilicic acid product offers excellent properties such as maintaining the fluoride levels when added in dental products, which offers growth predictions in the product market. Moreover, increasing application in sterilization and fumigation technologies and increasing demand for animal hide and tanned glass is likely to foster the industry growth.